We missed the first ferry (too full) and got on the second. We got seats, went to the bathroom and had a lovely ride. After arriving at the terminal in Staten Island, we waited for an hour to get a bus to the starting village. A volunteer we asked said something had gone wrong with the buses but it eventually resolved and we got to the starting village….late. Matt and I were in Wave 1, and we got to the village well after our wave had moved to the bridge. So we started with Wave 2. No big deal. It was misty and rainy at the start and largely stayed that way for the whole race. 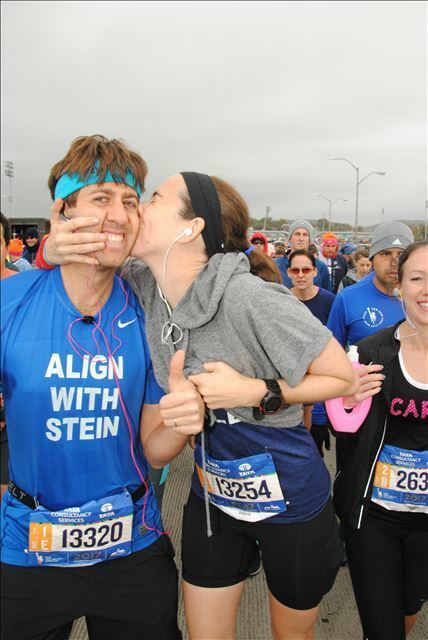 Matt and I got to start together on the Verrazano Bridge which was very wonderful. It was incredible to be there together. 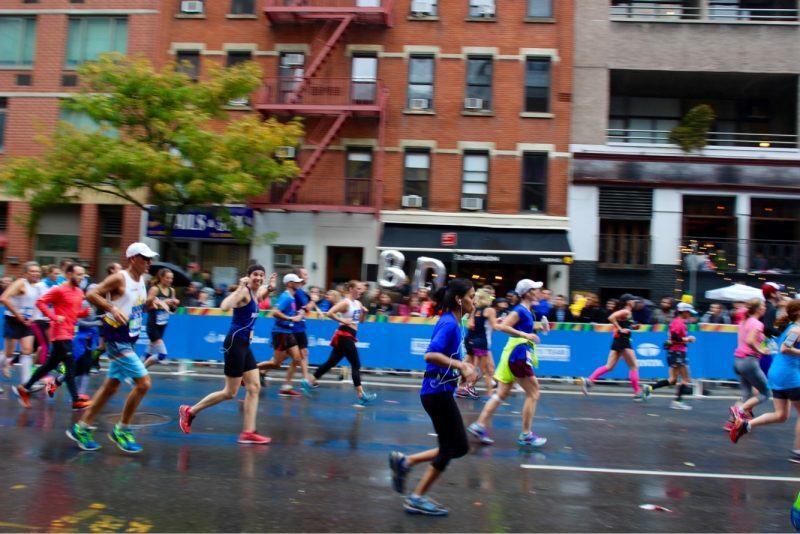 Frank Sinatra’s “New York, New York” played as it does before every wave of every NYC Marathon as far as I know. I had thought about this moment many times. Standing on the bridge, hearing the song and being a part of the tradition. I thought I’d be more emotional, but I was mostly just overwhelmed. They blew the starting whistle (or maybe they shoot a gun?) and Matt basically yelled “eat my dust” and we each started our race. I ran over the top of the Verrazano Bridge (some corrals run on the bottom). I heard a few things about the bridge. The first is that even though it is very steep, you won’t notice the incline since the energy and excitement from starting the race carry you. Well, I absolutely 100% noticed the incline. I thought this bridge was tough. The second thing people say about the Verrazano is that if you’re on the bottom, you might get peed on from runners on the top. I don’t understand how that would happen. The bridge has a solid cement floor, not a grates. I feel like that’s asking a lot of the wind. I was in the Orange Corral. 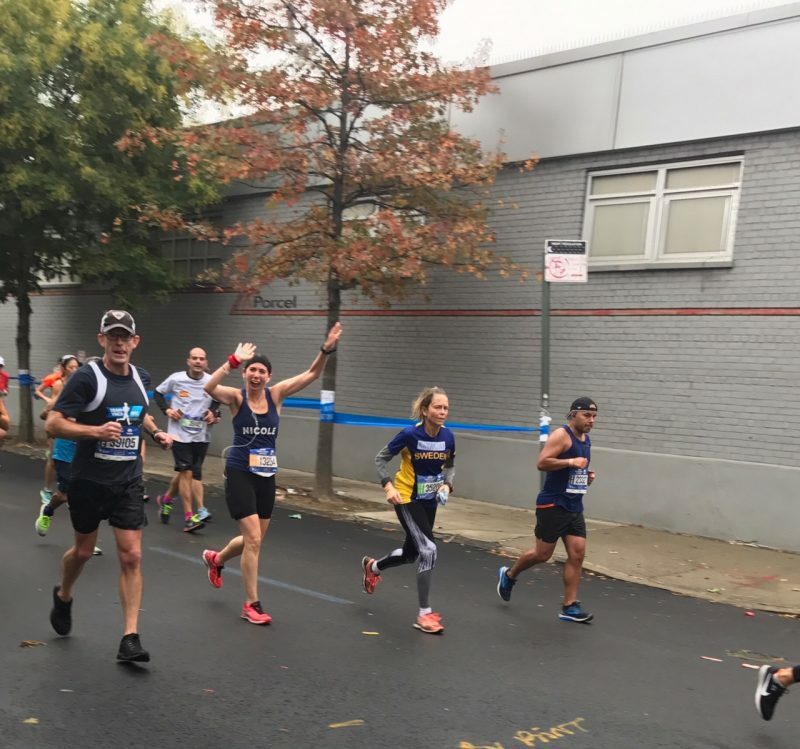 The marathon is actually split up into three different groups for the first couple of miles and the corrals meet up on 4th Avenue in Brooklyn. The Orange Corral makes a lot of sharp turns which was sort of a lot to take in in the beginning of the race. We’re on the top of the bridge at the start though, so some might say it’s worth it. Many people say Brooklyn is their favorite part of the race. I get why. It’s so diverse population-wise, but uniformly enthusiastic. People in Brooklyn cheer for EVERYONE, not just the people they know. Early on I saw a sign that read, “Run and don’t stop until you’re proud.” I loved it. I also saw a small bodgea-owner/grocer in front of his shop giving out bananas from his store with a huge smile. It nearly moved me to tears. Young Hasidic girls handed out water. Hipsters had silly costumes and snarky political signs. Brooklyn was also a great stretch for me to see friends: I saw my pals Mike and Lauren at Atlantic Terminal, and about a mile later saw Dana (my sister-in-law) and my friend Camilla and her family. They were holding photos of my face and wearing leggings with my face and Matt’s face all over them. (Though I didn’t notice at the time). I asked Dana to come run with me and she jogged with me for a quarter mile carrying a bag full of sticks with my face. Then I got to mile 11 and saw my pals Aman and Steph. It was incredible to see them jumping up and down in the rain. I also saw Runar Gunderson in Brooklyn. 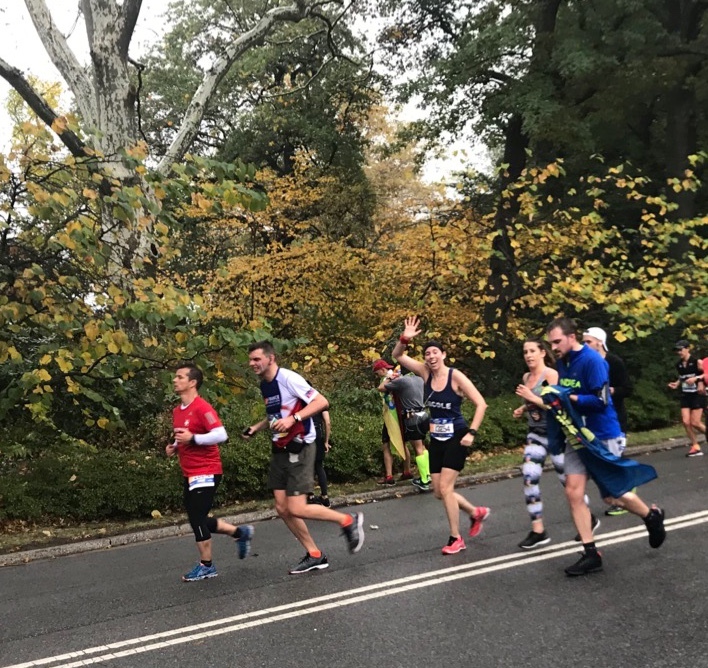 If you’ve ever run the NYC Marathon and googled anything about it, you may have found his prolific website, runarweb.com. I read his site many, many times leading up to this race. I thanked him for his work, congratulated him on his 39th consecutive marathon, and then passed him. To be fair, I’m half his age. Now may be the right time to tell you I had a race plan. My super specific plan: Keep it slow and easy in BK and if all goes well BOOK it after the Queensboro Bridge. So I held myself back for the first 16 miles and kept an eye on my Garmin to make sure I wasn’t getting out of hand. I really like the Pulaski Bridge. It’s this short little weird bridge connecting Brooklyn and Queens. I didn’t know about it before I started training for the marathon. It’s my favorite of the five bridges in this race. I ran over it, officially hitting the half-way mark. Score. My parents, sister and sister’s boyfriend were waiting right before the Queensboro Bridge. 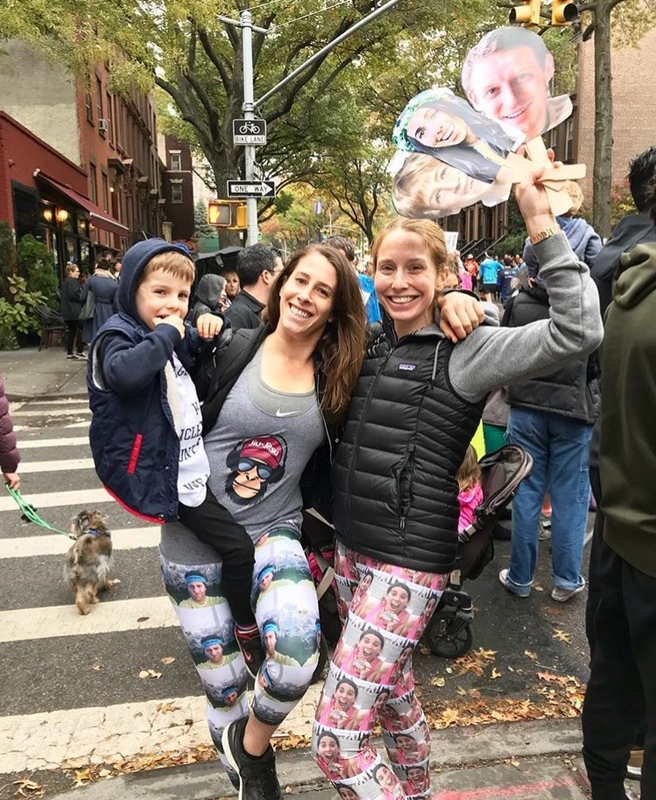 They made awesome sweatshirts to cheer us on and had giant photos with my face and Matt’s face. I’ve run the Queensboro (aka 59th Street Bridge) at least 10 times. I was excited for this part of the race because I thought I knew what I was getting into, and in hindsight, because I was cocky. To put it in no uncertain terms: The Queensboro Bridge was so much harder than I imagined. Why? I have three reasons. First, during the marathon you run in the middle of the lower level of the bridge. I found it sweaty and claustrophobic. The running path/bike lane I usually cross the bridge on is uncovered so you get fresh air. Second, all of my reference points on the bridge are of Roosevelt Island (the view from the bridge on the north side), and we ran on the south side. I felt a bit lost and unfamiliar this time around because I couldn’t see any of the landmarks that let me know I’m almost done. Third, it felt way steeper than ever before. This is not the bridge’s fault. I was probably just really tired from having run 16 miles. My plan of speeding up after the bridge was squashed when the bridge knocked me out. First Avenue, for me at least, is the most iconic part of the NYC Marathon. Many people say they don’t hear a “wall of sound” (aka shouts of cheers when you get off the silent, spectator-less bridge) but I did. The bridge has no spectators (they don’t let non-runners on the bridge). I heard screams of support descending the ramp and it was VERY cool. It felt surreal to be on the course and not cheering on First Ave, where I have stood the last few years to support friends. I was hurting from the bridge so I wasn’t able to pick up my pace as much as I wanted to here. Right off the bridge, I saw Matt’s cousin Taylor and her boyfriend which was unexpected and wonderful. Further up I saw my friends and coworkers Eva and Jenna, and my friend Riana. I also saw Matt’s family and my friend Katy and her family. I was struggling a bit here. My back (the base of my spine) started to really hurt and I was getting blisters from running through so many puddles. I started walking through water stations on First Ave and even took some Tylenol for my back. It didn’t help. A lot of my friends said the Bronx was the hardest and their least favorite part of the race. I liked it. To be clear, I hated the Willis Avenue Bridge. It is some sort of trick piece of construction with two inclines instead of an incline and a decline like every other bridge has. The Bronx had great music and more people than I thought it would. It was a short in and out. I saw my friends Blake, Timmy and Haley at mile 21 or so and they had such great energy that made me feel so good and gave me a second (third? fourth?) wind. I ran out of the Bronx and there was Dana (my sister-in-law), on the corner near Marcus Garvey Park and she was ready to run with me. We hadn’t discussed this beforehand but she surprised me and jumped right in. We passed by my pal Caroline who was the only spectator around for blocks and it was amazing to see her. Not long later, I saw my pint-sized friend Lynn bouncing up and down like Tigger from Winnie the Poo above the crowds. It was awesome. Once 90th Street (and the turn into Central Park) was in sight, I booked it. I knew I’d be rewarded with a decline in the park and I couldn’t wait for it. 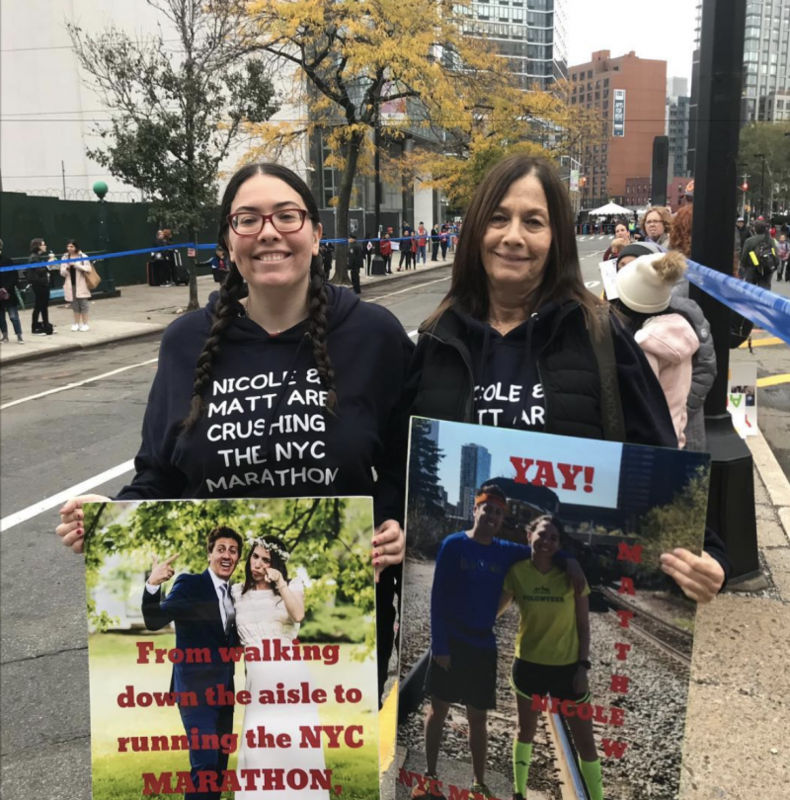 At mile 24, I saw my family again, which was awesome. Dana left me around here and I ran as fast as I could (but not as fast as I wanted) down Central Park South. 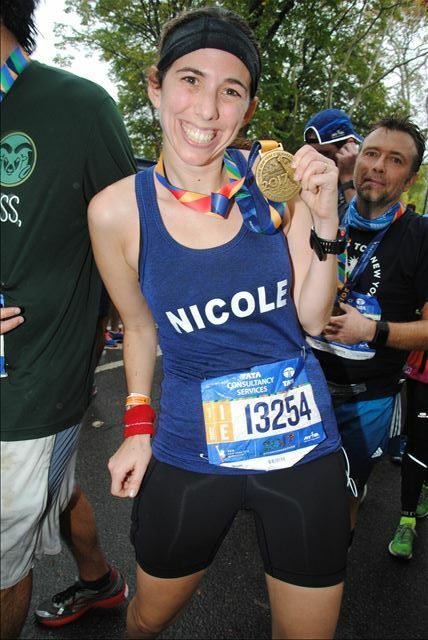 I crossed the finish line and was THRILLED to be a marathoner. I turned my phone on (it was in airplane mode to save battery while I listened to music which by the way was the Hamilton soundtrack and my running mix). I called Matthew and learned he had beat his goal time. He also had tracked my finish and told me my time. A lot of people complain about the long walk from the finish line to the exit of the park. And it is very long. It was raining so we were cold waiting for our ponchos. But I was just so happy. I chatted with everyone. I offered to take everyone’s photo. Congratulated everyone and accepted everyone’s well wishes. A security guard opened my gatorade because I was 100% too weak/wet/sweaty to do it myself. It’s amazing how after a few hours of running a sealed bottle can be a finger torture device. I told him he was my hero. He was. The man who put my poncho on me wrapped it around me like he was styling me for a runway. I loved him, too. After the race, I hobbled over to Matt’s parents apartment where our families were waiting for us to celebrate and eat. So now it’s over. Would I run another marathon? YES. 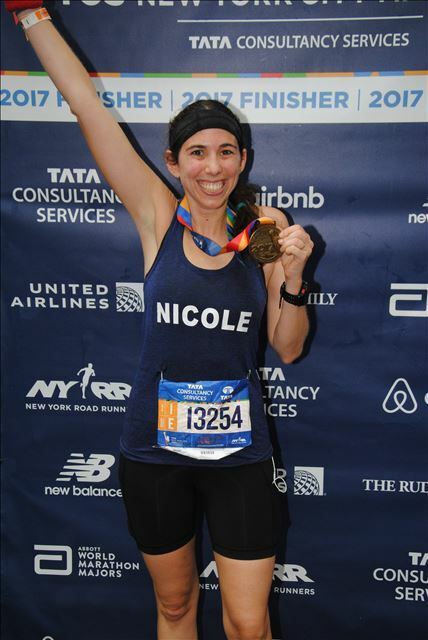 Would I run the NYC Marathon again? Maybe. It’s such a hassle logistics-wise that I’d be open to trying something new. I loved training and I am so proud to have done this. NYC is such an overwhelming race. Especially for your first marathon. There is just SO much going on along the sidelines while you run. (This may be a metaphor for life in New York.) When you train, it’s just you, trying to entertain yourself so there is really no way to prepare for the circus of events happening during the big show. At the same time, I am also entirely thankful for the crowds, noise and positivity. 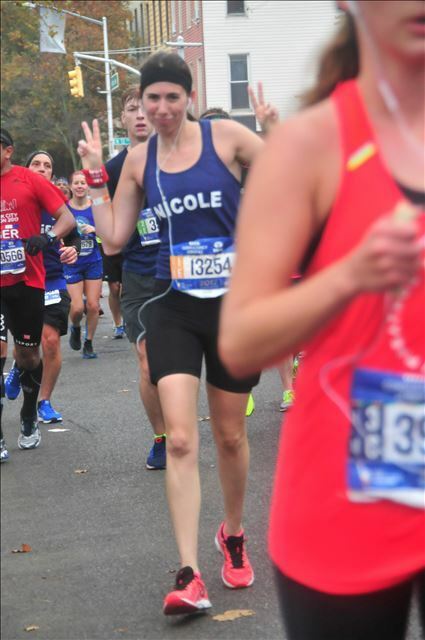 I love the NYC Marathon both as a spectator and as a runner. I can’t thank my friends and family enough for their support and enthusiasm. I can’t imagine another race like this one and it’s all because of you guys. What did I eat? About 5 Gus. I wish I had purchased more of my favorite flavor (Roctane Chocolate Sea Salt, it tastes like frosting) but I had a mix of chocolate, vanilla, coffee and caramel. Around 7pm, Matt and I went back to the finish line where some people were still completing their races. I cheered like hell. 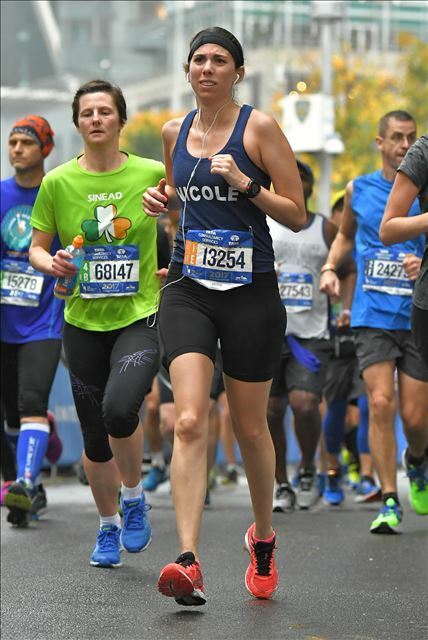 Did you run NYC? How did it go?! Chocolate sea salt, mm, will have to look for that one. Haven’t seen it at JackRabbit UES. I keep sampling my way through all of them. Cherry chocolate and gingerade currently winning. a million congrats, it’s one of the hardest and most rewarding things to cross that finish line!!! You did it – joyfully, vividly, well done! Thank you so much, Scott!! thank you so much!! when did you run boston?? 2015. I also qualified for 2016, but didn’t make the cut that year. Whomp, whomp 🙁 Now I need to put NYC on my bucket list! yes i totally recommend it! !